The following letter was received from a parent attempting to enroll her daughter at Emery Unified School District. The parent tells us this letter was ignored, having received no response from either the School Board individually or as a group or the Superintendent of the schools. My name is Amy (Ames) Simpson. I am a parent of a child who will attend Anna Yates Kindergarten in Fall 2013. I am also an Emeryville resident and serve as the Vice Chair of the Emeryville Child Development Center (ECDC) Advisory Committee. This is a letter to the Emery Unified School District (EUSD) and to the School Board. Yesterday, I carved out time to drop off a student enrollment application and all the other required documents. First, I went to the EUSD website for information as to where I should submit my application. Though I am aware that the Secondary School has been closed to students for some time, I figured the EUSD website would have the most up-to-date information given that this is the time parents will be seeking information on how to enroll their children for Fall 2013. I thought maybe the administrative offices would be open, even if this campus is closed, because the website referred me there. So I went to 1100 47th Street only to discover locked doors and a sign referring those seeking the new City/School Meeting location, but nothing referring me to a District or Administrative office. Next, I called the number listed on the website 510-601-4000 (yes, in my haste, I missed the address in fine print in the footer of the webpage). I pressed 3 to reach the District office, and then 1 to get information on the location to the District office. I figured (per the website) this is where I would need to go to submit my application. I was greeted by a recording that referred me to 4727 San Pablo Ave. with office hours of 8:30 to 4pm (a different administrative address from the one listed under the online section “How to Enroll”). So, I went around the corner to discover that this address was also outdated. There was a sign on the door that referred me to 61st Street. Eventually, when I made it to the 61st Street location, a woman directed me to Anna Yates reception on 43rd Street. Once I made it to Anna Yates, the process was simple and seamless. My daughter is now enrolled. However, as you can imagine, I was flustered and incredulous that information this basic was difficult for me to find, that I found myself on a wild goose chase to simply drop off an application. I cannot emphasize enough my dismay. I’m a resident who knows a thing or two about what’s going on in this town, but trusted the School District to provide the public with up-to-date information, as I would think this would be their first priority – to keep the public informed about where they are, and how to enroll one’s child (where to submit applications). But I must admit that I am not surprised that the School District has failed to update this information. I can only imagine how frustrating this would be for residents or parents of inter-district transfer students who don’t know the history of EUSD’s transitions (by the time I made it to the 61st street location, I knew that I should have done what my intuition told me made the most sense – go directly to Anna Yates), or who are not familiar with the various addresses, or for whom English is not their first language. Several years ago, the Emeryville School Board, as well as some of Emeryville’s City Council members, asked me for my support for Measure J. I was one of the few who didn’t believe the rhetoric about what this measure could do for families in Emeryville, and I was also adamantly opposed to the concept of co-locating grades K-12 on a site that’s too small for our kids. Additionally, given my first hand experience with how poorly City Staff and the Emery Unified School District have traditionally coordinated with the public or with their own school feeder, ECDC, I was certain the District would fail at running a K-12/community partnership. Even with my skepticism, I have held out hope that somehow, miraculously, the Emeryville Center of Community Life will solve the District’s woes. Sadly, no matter how often I try to give the District the benefit of the doubt (because after all, Anna Yates is currently the only option for my daughter), they continue to show me evidence that they lack what it takes administratively to keep the public informed and that basic operational, administrative tasks (such as making sure the correct and consistent address is on their website, voicemail and buildings for parents looking to enroll their children) are currently too much to manage. Please tell me how the School District and Board plan on managing a co-located school that doubles as a community center when no one is able to update the website or make adequate signage at the existing/closed locations, or update the voice recording - all the District’s first points of contact with the public? Yesterday, the only point at which I did not encounter friction was at the actual campus of Anna Yates. Given what I know about this school, along with yesterday’s experience with the Anna Yates admin, it makes me sick inside to think the one thing that is working for this District will be closed within a couple of years. I have a ton more to say about how disingenuous I think both the District and Board have been when promising at the time Measure J was on the ballot that closing Anna Yates was not a foregone conclusion. And I have a ton more to say about how absolutely ridiculous some of the plans have been for the K-12 site (like CAB financing, the poorly thought out pick-up/drop off, a non-regulation track - what’s the point, and reneging on building to environmental standards, to name a few). I am one of nearly a dozen parents from ECDC who will be sending their kids to Anna Yates next year. Nearly all of us believe that in several years, no matter how architecturally impressive the new site, we will be scrambling (because the District is disorganized and no one has informed us how they intend to find the funds to pay for much needed programming) to figure out alternatives for our children, or live with the bitter taste of resignation. Some may move out of the district, others may apply for inter district transfers, some may apply for financial aid at independent schools, while others look to local charters, but few of us have faith that EUSD or the School Board will help us keep our families invested in this District. And if, in the end, this tight knit community breaks apart, with families dispersing, daily connections lost, I will hold you partially accountable. I will blame you for failing to listen, for being in denial about the District’s limitations, for wasting an opportunity, for being out of touch with the needs of the many families that live here, and for changing the character of what currently makes Emeryville special. So, for the sake of my child and the children of Emeryville, will you all please, PLEASE, PLEASE help the District get its act together? I recognize that my tone is angry, but you have to realize that what I experienced yesterday represents a larger, ongoing systemic problem that no one seems to be addressing; a problem that undermines my ability to believe in your vision. When school bond financed construction projects go over budget, school officials have hard choices to make. If the district used a Capital Appreciation Bond like Emery Unified School District, and the district has no more borrowing capacity, an over budget project means cuts have to come from somewhere in the project. The Weekly Calistogan chronicles just such an event. Like Emery, interestingly, the Calistoga Joint Unified School District hired Emeryville bond firm Caldwell, Flores & Winters to finance their school construction project. As more and more voices are added to those grumbling about the late start for Emery's school project known as the Center for Community Life and talk of the project being behind schedule is bandied about, Emeryville residents might want to hear about the plight of our neighbor to the north; their cost over-runs and project downscaling. As Emeryville residents wait for the demolition phase of our own school project to begin, now reportedly some months late, perhaps our Center of Community Life will be likewise be referred to as a "Ferrari with roll-up windows." An agreement to move forward with construction for a long-anticipated multi-purpose room at Calistoga Junior-Senior High School was approved by the school board, but not without some anguish and consideration of delay of the project. Monday’s Calistoga Joint Unified School District board of trustees meeting placed board members in a quandary when they learned the multi-purpose room was already over budget before ground has been broken. “Disappointing is a pretty light term. You’re holding us hostage is how I look at it,” Trustee Marty Hunt said at the meeting. The room, which will function as the first-ever indoor cafeteria for the school, is already about a half-million over its $2.4 million budget. Overruns in the current gymnasium project are cutting into the multi-purpose room. Trustee Julie Elkeshen was the lone “no” vote on the general contracting agreements that would accept Blach Construction as the general contracting firm for the project. Other members said they felt they had no choice but to vote “yes,” though they made it clear they were unhappy with approving an agreement that already had to be scaled back. “It is with great reluctance that I move to accept,” said Hunt. It was the scope of reduction that ruffled the feathers of Elkeshen most. “I wanted to go back to the original plan,” she said. Jeff Threet, program manager of Caldwell Flores Winters, the program management service company overseeing the district projects, delivered the bad news. Threet said he had suggestions for where the budget shortages could be made up, including reducing or eliminating the landscaping, cutting back on the quality of kitchen equipment, and other options. The board and members of the audience were less than thrilled with any more reductions in the project given that they had already agreed to reduce the overall size of the multi-purpose room. “It’s like getting a Ferrari with roll-up windows,” said one man in the audience. The board moved to approve a portion of a change order related to the gymnasium project, which included a reduction in the multi-purpose room’s contingency funds. When discussion turned to postponing the multi-purpose room until more funds could be found to fully fund the project, Chris Canning, speaking as a member of the Chamber of Commerce, stood and urged the trustees to move forward with the project and not delay. Ex-employees allege that pizza chain engages in misogyny and emotional abuse. Company officials deny the charges. Last week at the Temescal location of Lanesplitter Pizza, two employees quit their jobs in dramatic fashion: At around 8 p.m. Monday, when the Telegraph Avenue restaurant was at close to full capacity, the servers cut the music, stood up in front, and announced that they were walking off the job. "This is the culmination of many conversations with management that haven't been heard," one of the servers told What the Fork, paraphrasing what she said that night. "We hope that people will get in contact with management to show that the community is on our side." Then, the two proceeded to leave — to resounding applause from customers, by their account — and headed over to Lanesplitter's other two pub locations, in Berkeley and Emeryville, where they made similar announcements. Finally, one of the servers put up a post on the Oakland forum of the social media site Reddit, under the pseudonym "Amanda Swift," in which she outlined a series of grievances that included alleged misogyny, emotional abuse, and a deceptively inaccessible employee health care program. As of late Monday of this week, the Reddit post had received 231 "upvotes" and sparked 435 user comments, prompting Lanesplitter's founders to issue a formal response. Whatever discontent may have been fomenting behind the scenes at this local chain, the discussion — for better or worse — has now been taken into the public sphere. Swift, who declined to reveal her real name for fear it would hurt her future employment prospects, explained that she and her colleague also passed out flyers that alleged, among other complaints, "sexism and misogyny that ... pushes out female management or forces them to resign," "constant harassment by management to long-term employees," and "Lanesplitter touting themselves as benevolent employers that offer their workers good benefits when in reality very few employees are able to use these health benefits." Lanesplitter co-founder Daniel Rogers acknowledged that the culture of the restaurant has changed somewhat as it has grown to five total locations and more than one hundred employees. But he's insistent that the company treats workers well. "We pride ourselves in providing the best workplace we can for our employees," Rogers and Vic Gumper (Lanesplitter's other co-founder) wrote in a response posted on the company's website. Rogers and Gumper denied the charge of sexism, saying that, while the company doesn't currently have a female general manager, "the most recent management vacancy was offered to a woman first." And, according to Rogers, about 25 percent of Lanesplitter's employees are on the company health plan, and he's hopeful that that number will increase: "I want people on this policy because it's good for them and it's good for us. ... It's not a bogus program. "Swift said she's aware that Lanesplitter's employees are better off than workers at the many other restaurants where, for instance, there is no employee health plan at all. The problem, she said, is Lanesplitter tries to pass itself off as better than those other restaurants. "They've had this narrative of, 'We're this great restaurant that takes care of our employees like they're family,'" she explained — but, according to Swift, that reputation is no longer merited. "Just don't think you're doing some great thing for humanity when you go to Lanesplitter. Treat it like you're going to Domino's." Nevertheless, a number of former and current employees said they were either unfamiliar with the details of the company's health insurance policy or felt it was unattainable. One current Lanesplitter employee said she couldn't recall having a single conversation with management about health insurance. She also described the managers of Lanesplitter's three pub locations as "bullies" who get away with bad behavior because of their friendship with the owners: "The bosses are responsible because they turn a blind eye. They play a passive role." Will O'Connor, who worked as a delivery driver for Lanesplitter for nearly three years, until last July, described the work environment as "pressured, cramped, and stressful," and said that management was highly controlling. For instance, he described a "no-talking policy" wherein "employees would be told to immediately stop talking to one another out of nowhere, with no clear criteria given as to why they had to do so. "What happened Monday night was a long time coming," O'Connor added. Ryan Lee, who worked as a dishwasher for a little more than one year, described the sanitary conditions at the restaurants' kitchen as "disgusting," as a result of the staff being overworked and underpaid. Lee said he hoped the walkout would lead to management allowing workers to have more input into how the restaurant was run. According to Rogers, no employee has missed a day of work since last week's walkout. He also stressed that the company has an "open door policy" with respect to staff concerns. The bond selling firm employed by Emery Unified School District is being sued by another school district for the same activities that it engaged in here. Emeryville Capital Appreciation Bond giant Caldwell, Flores & Winters is being sued by Northern California's Willits Unified School District for breach of fiduciary duties in its financial services that has led the district to the brink of insolvency. Further, the district contends Calwell, Flores & Winters violated state conflict of interest laws since it benefited financially from its advisory campaign work during that district's school bond election. Caldwell's financial services provided to Willits Unified has left that district reeling. In March, Willits joined Emery when it received a "qualified certification" from the California Department of Education, meaning that the district is in danger of failing to meet its financial obligations. SAN FRANCISCO — A small California school district said its financial advisor "duped" it into overpaying hundreds of thousands of dollars for services in a lawsuit that is playing out amid controversy in the state over school bond election and borrowing practices. Advisory firm Caldwell Flores Winters, Inc. sued Willits Unified School District for breach of contract, resulting in a counter-complaint from the Mendocino County district with 1,800 students. Critics say the legal dispute has uncovered questionable, if not illegal, practices. "To me it is just outrageous, forget about fiduciary duties, that any advisor would ask to be compensated in this manner," said Timothy Schaefer, owner of Magis Advisors, an independent municipal financial adviser in Newport Beach, Calif. "I am struggling to find words because it is so over the top." In April 2012, Caldwell Flores Winters sued Willits Unified for failing to pay the financial advisor $278,961. The district in December filed a cross-complaint against CFW that alleged violation of state conflict of interest laws, the state political reform act and breach of fiduciary duty. Willits Board of Trustees members said they felt "duped" by CFW as the district teetered on insolvency, according to meeting minutes. Neither school district officials nor their lawyer returned calls for comment. The advisory firm convinced district officials to seek a bond authorization well beyond what the district would legally be able to issue because the larger figure would generate more fees for Caldwell Flores Winters, the district argues in its lawsuit. CFW was hired in 2009 to advise the school district on the bond program that led to the issuance of four series of bonds totaling $18.87 million in July 2010, which will cost $38.6 million in debt service. The sale included $3.78 million of capital appreciation bonds that will cost $21.9 million at maturity, the official statement said. That series also included a $4.97 million bond anticipation note with 5% interest due July 2014, which the district has been scrambling to figure out how to pay. It has considered further borrowing to pay off the debt. Willits alleges in the suit that CFW recommended the highest amount of bond authorization for which to ask district voters out of four options, with the lowest being $28 million. This, Willits Unified argues, represented a conflict of interest because CFW influenced a decision that directly affected its compensation, which is generally banned by state law. The contract also represented a breach of fiduciary duty. The district's complaint said CFW initially assumed a $29 tax rate per $100,000 of assessed valuation in the district, which would have supported $23 million of bonding. Even though it was aware that assessed values had dropped in the district after the election, CFW charged Willits a 2.5% fee for the $43 million capital program it advised the district to adopt even though only $18 million was available to fund school construction, according to the cross-complaint. That fee — $1.075 million — was due in 36 monthly installments after the bond election passed. CFW sued after Willits cancelled the contract, seeking six months of payments plus a $108,993 cancellation fee for a total of $278,961, according to CFW's complaint. Neither CFW nor its lawyers returned calls for comment. Even if the district eventually can issue the full $43 million authorization for its construction projects, it would be long after the contract with CFW would have expired, the district argued. The fee for advising on the capital program was based on a $43 million program that was impossible to achieve, the district argues in its cross-complaint, the district is not obligated to pay the full sum. "CFW knew it could perform program implementation services for only approximately $18 million of the bond projects during the five year term of the contract," the cross-complaint said. CFW was paid more than $200,000 for financial advisory services and another $185,000 for the implementation of bond projects, the district said. CFW was also paid $15,000 for conducting voter surveys. The complaint also alleged that CFW did not advise that the district needed to hold competitive process to select CFW to provide construction management project services. "CFW performed acts herein alleged with the intent to deceive the district so as to engage in self-dealing and to generate extraordinary and unwarranted fees," the district's lawyer, William Ayres, said in its complaint. Mendocino County Superintendent of Schools Paul Tichinin, who has advised the Willits district on its troubled finances, said in a phone interview that Willits has suffered from declining assessed valuations, lower property values and a terrible economy. Tichinin said the district is trying to find ways to pay for bond anticipation notes that are due next year amid falling tax revenues. "The fiscal status of the district is independent from the bonds other than causing worry and concern," Tichinin said. In March, the Willits district was one of 117 in the state to receive a "qualified certification" from the California Department of Education" meaning that based upon current projections, the district is in danger of failing to meet its financial obligations in the next three fiscal years. An additional seven districts received the more serious "negative certification." California Treasurer Bill Lockyer's office said he is troubled because CFW had a financial interest in recommending the highest bond authorization. "If that doesn't violate conflict of interest laws, it should," said Tom Dresslar, Lockyer's spokesman. "This is the kind of stuff that is giving school bond finance a bad name." Lockyer has been trying to limit schools' ability to issue capital appreciation bonds, arguing that they cost taxpayers too much for too long. According to the treasurer, from 2007 to November 2012, CFW made far more money from California school bond sales that included capital appreciation bonds than any other financial advisor firm. Dresslar also pointed out that it was questionable that the district paid CFW $15,000 for pre-election voter surveys. Lockyer sent letters in March to Attorney General Kamala Harris asking her to give an opinion on the roles of underwriters, financial advisors and bond counsels in school bond elections. The SEC's office of compliance inspections and examinations is also conducting an investigation that may be looking at the involvement of some muni advisors in bond ballot campaigns that could violate the fiduciary duty standard and fair-dealing rule. Caldwell Flores Winters was also paid thousands of dollars as a campaign consultant by the election committee in support of the $43 million of bond authorization. The committee also received donations from the underwriter on the bond sale, Stone & Youngberg, and the bond counsel Jones Hall, according to county election filings. CFW also negotiated the bond sale fees with the underwriter, as outlined in the contract included in court documents. Last year The Bond Buyer reported some advisors were helping California school districts by serving as consultants to bond ballot campaigns, and then as financial advisors on the bond deals approved by voters. State Assemblyman Don Wagner, R-Irvine, has proposed legislation that would prohibit a local agency from working with an individual or firm on any bond deal if they provide services to the bond election campaign. Similar bills have been put forward and failed in the last few years. Wagner said he hopes the new attention on the subject will help get more support this year. Maybe this is the year. We would like to commend the Emery Unified School District for its effort to participate in the annual Waste Management Bulky Pick-up day. The above pictured pile of trash and toilets has been on the former Emery Secondary School site at the corner of 53rd Street and San Pablo Avenue for many weeks. 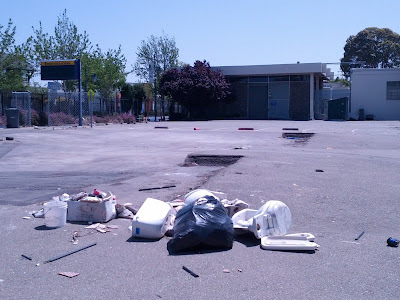 We would note however, that Waste Management requires that items be place curbside, not behind a fenced area, and that may explain why the above pile of trash is still there. Additionally, Waste Management encourages individuals to place items out for pickup the evening before, not weeks in advance. Better luck next year! 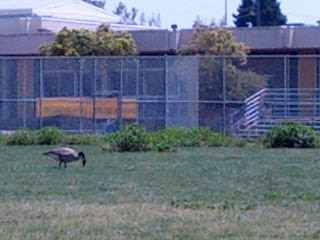 We are also impressed by the District's recent efforts to create nesting grounds for wild Canada Geese. While some might believe the large growths on the Secondary School's fields are overgrown weeds, we are sure these are part of a wildlife environment improvement effort, giving the Canada Geese much-needed cover, protecting them from predators. We disagree with those that feel the demolition process has fallen significantly behind schedule. The District says they're on schedule and just because they're behind schedule doesn't mean they're behind schedule. We disagree that Emeryville residents that want to use the field or the city's only public swimming pool should have been accommodated. Why have water aerobics or teach Emeryville's youngest children to swim when we could create a nesting ground for geese instead?! Bravo again to the School District for its foresight and planning. If these are any indicator of what we can expect from the future Emeryville Center of Community Life, then we cannot wait to see what the District has in store for residents next! could have Canada geese instead? After the City of Emeryville approved AgeSong, a senior assisted living facility on Horton Street at 40th Street some three years ago, neighbors started noticing an ashen stain on the side of the new building near the outfall of the smoke stacks of the adjacent Apollo Crematorium. The Tattler documented the growing stain and City Hall received complaints from residents at AgeSong, now Bayside Park and another residential complex nearby prompting a search for a new home for the crematorium. Oakland North reports on the rocky road trying to relocate this crematorium. Oakland neighbors have engaged in very heated discussions over the relocation, producing many opposing ideas, some half baked, over where to relocate. Oakland residents near the proposed relocation have accused the crematorium of engaging in a scorched earth campaign as they make their relocation gambit. The Neptune Society's crematory would be at 9850 Kitty Lane, near the Oakland International Airport. By now, the warehouse at 9850 Kitty Lane, near Oakland International Airport, was supposed to be burning more than 3,000 bodies a year. But instead, the 6,100-square-foot facility purchased last year by a funeral services business to serve as a so-called “mega-crematorium” is collecting dust. After a year of inactivity, though, that could change soon. In 2011, the Neptune Society of Northern California began the process of moving its crematory business to East Oakland from a facility it has operated in Emeryville since the 1970s. Neptune Society officials said a desire to modernize its facilities, plus the City of Emeryville’s decision to allow residential housing near its Apollo crematorium on Horton Street, prompted the company to try to relocate to Oakland. But a year ago, the Oakland City Council passed an emergency ordinance to block the Neptune Society from moving into its Kitty Lane warehouse, after environmentalists and community advocates expressed concerns that pollution from the facility would threaten the air quality of a nearby neighborhood. The Neptune Society sued the city over the ordinance a few months later, and the project has remained in limbo ever since. A court hearing between the Neptune Society and the city is scheduled for next month — around the same time the council’s moratorium expires. Cremation rates are rising. Today, 75 percent of bodies are cremated, compared to 40 percent in the 1980s, said Dan Isard, founder and president of Foresight Companies, which provides business consulting for funeral home owners. The increased demand is something Miller said the city should keep in mind. There are five crematories already operating in Oakland. Community leaders feel differently. In May 2012, Reverend Daniel Buford of Allen Temple Baptist Church in East Oakland sent emails to Mayor Jean Quan and councilmembers Rebecca Kaplan, Jane Brunner, and Larry Reid, asking them to stop the crematory from coming to East Oakland. Reid then introduced the ordinance at a City Council meeting on May 15, where it passed unanimously. The ordinance required the Neptune Society to get a conditional use permit (the company had already received a building permit), a step usually reserved for cases when the area is not zoned for a particular type of activity. The warehouse at Kitty Lane, though, is zoned for crematories, according to an email from Alex Katz, chief of staff to City Attorney Barbara Parker. Last August, Stewart Enterprises filed a lawsuit against the city that claimed the ordinance was intended specifically to block its crematory. The lawsuit argued that the additional requirement of the conditional use permit was unnecessary and violated the company’s legal rights. In a later court filing, the city said the property’s fate is still unsettled because Stewart Enterprises has not applied for a conditional use permit. The two parties are scheduled to meet on May 23 in Alameda County Superior Court in Oakland to see if they can talk through their differences and avoid going to trial. The moratorium is set to expire on May 10. Buford has started a signature campaign among community members to ask the City Council to make the emergency ordinance permanent. Environmental groups contend that the facility will fill the air with particulate matter and mercury vaporized from dental fillings in the cremation process. Mercury is a potentially lethal environmental pollutant. Elemental mercury, the kind found in dental fillings, is usually harmless if touched or swallowed, but can cause lung problems, brain damage or death if inhaled in small amounts over time, according to the National Institutes of Health. One body emits an average of 0.0034 pounds — one-twentieth of an ounce — of mercury during the cremation process, according to a Bay Area Air Quality Management District memo. Mercury emissions in cremations are becoming less of an issue though, because fewer people are getting dental fillings made of silver amalgam, which contains some mercury. Silver amalgam in fillings has declined in use since the 1970s. Jones said there are no schools or residents within 1,000 feet of the site. The Oakland location is better than the Neptune Society’s site in Emeryville, she added, because the Emeryville area is now zoned for residential buildings. Jones said residents can call an air quality complaint hotline with complaints about odors or visible emissions if they see excessive smoke. Since 2008, the Neptune Society’s Emeryville location has received only five complaints, Jones said, not enough to trigger the air district’s public nuisance violation. Neptune has never received a violation from the district. Many residents in the neighborhood said they were unaware of the proposal. Freddie Murray, an employee of the San Francisco Public Health Department, who was visiting a friend on Hesket Road, said the residents here are predominately older in age or Hispanic, and not vocal about local issues. "Triangle Residents Need More Exercise"
New City Manager: Will Secret Dealings Continue?